Compared with the other human apoproteins, physiological variations and metabolic functions of apo A-IV remain obscure. The apo A-IV has been discovered in rat HDL and has been later found in human plasma, mesenteric lymph and interstitial fluid. Apo A-IV is synthetized by intestine and liver and is catabolized by liver and kidneys. As apo A-IV has been suspected to play a role in triglyceride transport, we undertook the study of its plasma concentration in a population of subjects with various plasma triglyceride levels. 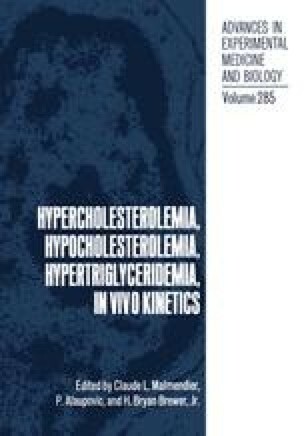 Moreover, recent studies brought some evidence for an implication of apo A-IV in the reverse cholesterol transport. Because recent reports suggested that HDL was the major lipoprotein class involved in this metabolic pathway, we investigated the structural and metabolic relation between apo A-IV and HDL.